The 1960s saw something of a short-lived fad for showing silent comedy shorts - or extracts from them - on British TV. Comedian Bob Monkhouse's programme Mad movies went on to spawn other similar shows, most of them deriving their titles from playing on the similar-sounding words "silents" and "silence", as in Silents please! and Golden silents. Even then, though, it was notable that the reputation of Charlie Chaplin, the biggest comedy movie star during the silent film era, was in the critical doldrums. That was partly for reasons that had nothing to do with his films themselves. His vocal and public support for left-wing causes - and revelations about his somewhat unorthodox love life - had cost him a great deal of his personal popularity, especially in the USA. In 1947 a US congressman had suggested that Chaplin's influence was "detrimental to the moral fabric of America" and even advocated his immediate deportation. Just five years later while Chaplin and his family were in Europe, the American government revoked their re-entry permits. But the comedian's critical reputation was also diminished by the post-war years' more cynical Zeitgeist. His films were - to some extent justifiably - seen as old-fashioned, overly sentimental and "Victorian" in their sensibilities. It was a sign of the times that, as Chaplin's reputation fell, that of Buster Keaton - whose comic style was harder, sharper and a million miles away from Chaplin's lachrymose, heart-on-sleeve approach - rose. The decline of Chaplin's critical reputation left, however, his three masterpieces of the sound era - City lights (1931), Modern times (1936) and The great dictator (1940) largely untouched and today many would argue that Modern times is his greatest achievement. Undeniably a "political" film in its criticism of unchecked industrialisation, rampant capitalism and modern society's uncaring treatment of the "little man", it also incorporates several very funny and very skilfully delivered slapstick routines as well as a charming love story focused on a feisty gamine, winningly played by Paulette Goddard. Its concept of romance isn't the heady, passionate one generally associated with 1930s Hollywood: Chaplin's immortal tramp may have been a bit of a crafty hustler at times, but he was always emotionally naive - and incapable, when it came to love, of anything but its most innocent manifestations. Although Modern times is a sound film, there is no dialogue as such. Thus, the purpose of its musical score differs significantly from that in other films where the storyline is driven by speech. In the latter, the emphasis is on those spoken words and the function of the musical score is to create or add to an appropriate background mood. In films without dialogue like Modern times, however, music is often related far more directly to the visual action or activity that, with no verbal elements to support it, frequently relies on the score to highlight or even to help explain what's going on. In consequence, performing the score as a stand-alone exercise, as is done here, can produce results that sound decidedly odd. Many of the episodes that the music is illustrating are so brief that the score at those points can be very fragmentary indeed. There are also many moments when the music is trying to be so precisely descriptive of an on-screen action - as opposed to just creating a general mood - that you long to be able to watch the film and to see exactly what actually occurred at that very moment. Conductor Timothy Brock himself makes that same point - even though he spins it in a rather more positive way - in a fascinating booklet essay where he writes "Chaplin's writing was so moment-specific, so tightly synchronised, that one can nearly follow a Chaplin film by only hearing its score without the benefit of the image." The performance on this CD by the NDR Radiophilharmonie is a very fine one. Conductor Timothy Brock is a well known specialist in music for silent films, whether restoring and recreating their original scores or writing new ones for such classics as The cabinet of Dr Caligari, Nosferatu and Sunrise. He has, for some years, immersed himself in work on Chaplin’s movies and he exhibits a genuine appreciation for their sensibility. CPO's recording engineer Helge Martensen's expertise has resulted in a warm yet brilliantly clear recording that does full justice to the performance. 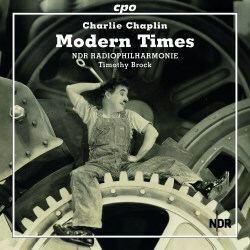 I warmly recommend this disc for admirers of Chaplin's films who are already familiar with Modern times. Anyone else needs to watch the movie first if they are really to appreciate this CPO release. In fact, come to think of it, is any such excuse really necessary to justify getting hold of a DVD and laughing through tears as you watch this immensely enjoyable film yet one more time?